Campobello Island, although part of Canada, lies off the coast of northern Maine at the mouth of the Bay of Fundy. From the late nineteenth century through the early twentieth century, the island was a prominent destination for wealthy families to vacation during the summer, and in 1883 FDR's parents brought him there at the age of one. The family enjoyed their stay so much that James Roosevelt, FDR's father, purchased a home on the island and his family took up summer residency there in 1885. FDR enjoyed his family's retreat on Campobello immensely, and ER visited for the first time in 1903 at FDR's invitation while the two were still courting. After their marriage in 1904, the couple would return to Campobello virtually every summer, spending weeks sailing, swimming, fishing, and enjoying the temperate coastal climate. In 1909 FDR's mother, Sara Delano Roosevelt, purchased a larger home for Eleanor and Franklin, retaining the original cottage for her own personal use. The couple quickly transformed the new house into the summer destination for their growing family, normally spending all of July, August, and then the first half of September on the island. 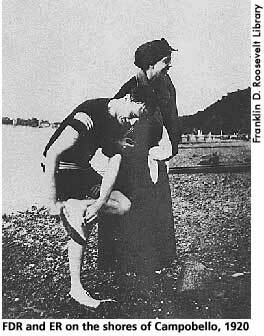 ER and FDR both adored Campobello and looked forward to visiting frequently, but in 1921 it was at Campobello that FDR contracted polio at the age of 39. FDR's illness ushered in a new era for the Roosevelts, and although FDR would not return to Campobello until 1933, ER continued to vacation there frequently. After his 1933 respite in Campobello, the president would only return twice more before he died, preferring the healing waters of Warm Springs, Georgia, to the rugged coastal climate of maritime Canada. Nonetheless, ER continued to visit often, making her last trip to the island just a few weeks before her death in 1962. In 1964, President Lyndon Johnson concluded an agreement with Canadian Prime Minister Lester Pearson that created a memorial park to FDR at Campobello. With the house as its centerpiece, the park serves as a historical monument to FDR and to the strength of the United States-Canada relationship, remaining one of the only such sites in the world that is jointly administered by two governments. Lash, Joseph. Eleanor and Franklin. New York: W.W. Norton & Company, 1971, 222-223. Lash, Joseph. Eleanor: The Years Alone. New York: W.W. Norton & Company, 1972, 187, 325-326.